When there are rough environmental conditions the series C16-3 is in. The program includes a variety of housing types and a wide range of contact arrangements and contact technologies. 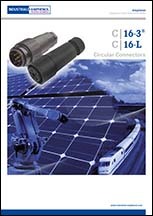 Solutions up to 900V or 50A can be realized. The housing made of high performance composite material is extremely robust and allows a low weight of the connector. There are versions with the proven screw terminals for easy field installation and crimp versions for cost-effective machine processing. The bayonet quick release allows an easy and reliable handling of the connectors.